Oberlin Stamps Scholar Nina Josephson was inspired by her family of artists to pursue a creative career in visual media. A third generation artist, Josephson went to LaGuardia High School of Music & Arts in New York City where she was involved with language and learning about Latin America and East Asian cultures. She studied Hindi and traveled to India through the U.S. State Department. She was drawn to Oberlin because her older sister was an alumna. She wanted to go to a small liberal arts school where she could be engaged in social activism. While she initially planned on just studying history with a focus on socialist movements, she was drawn back into art. She studied Spanish and traveled to Guatemala her freshman year to learn about the genocide of indigenous people during the 20th century. With the collective’s focus on community activism, Josephson has worked on projects for the 2017 March for Science and helping others learn printmaking. She is also a member of the college’s co-operative houses, an opportunity to live with other students and work together to build community. As she became more involved in creating art, she developed a fascination with the line between life and death and began pickling and preserving dead animals such as mice, fetal pigs, and even a squid in jars and presenting them in installations. This past summer, she dove into textiles interning with shoemaker and artist Emily Spray. Josephson learned to work with leather and combine functionality and art. Currently, she is in her senior studio class, spending the full year working on a major instillation that calls into question human nature. 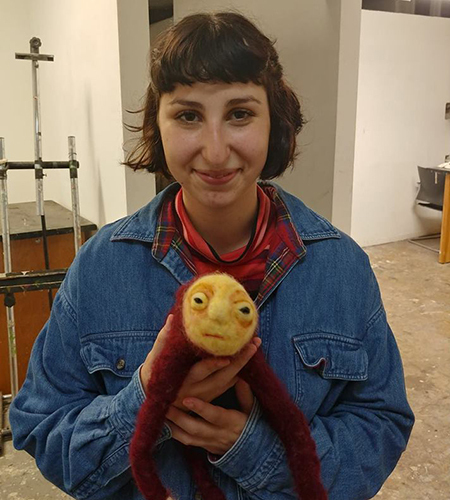 By using felted objects and papier-mâché, she is attempting to create new life in order to spark self-reflection in others and herself. She also enjoys the opportunity to explore traditionally craft mediums like felt and expand what’s considered art. She highlighted the benefit of studying art in an academic environment and the encouragement to take herself more seriously as an artist and to express something about the way she sees the world. For her work, she was recently nominated for an Excellence in Visual Arts Award through the Association of Independent Colleges and Universities of Ohio. In the future, she would like to teach middle or high school. Her life goal is to be able to create art every day, whether that’s for her job or hobby.